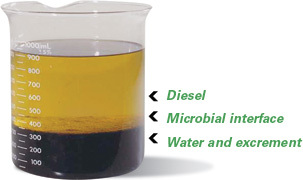 We understand that since the introduction of Ultra Low Sulfur Diesel (ULSD) business owners have been forced to deal with issues associated with microbial contamination and increased water levels in diesel fuel storage tanks. Premature fuel-filter plugging and fuel tank corrosion can be prevented, as long as you have the tools and knowledge available to solve these issues. Let us help solve costly contamination issues. > Are your fuel-filters clogging? > Are your fuel-injectors failing? > Your fuel and fuel tanks could be contaminated! Prevent costly downtime and wasted maintenance dollars. Give us a call today and schedule a free fuel test of your tanks. Microbial contamination can be identified by injecting a 5cc sample of fuel into a Liqui-Cult fuel test which provides a food source for microbes if present to grow within 72 hours. The Liqui-Cult will turn red after 30 hours if the fuel sample is contaminated with bacteria. The Liqui-Cult will grow fungus after 72 hours if the fuel sample is contaminated with fungus.